Michael Rakowitz’s (P)LOT project is a car-shaped tent that restores parking spaces to pedestrians as street-side camping. 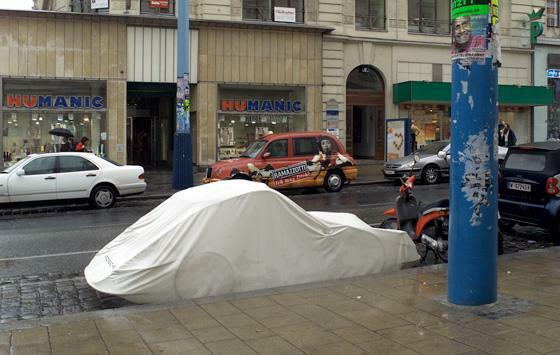 Constructed with a standard two-person tent and a commercially-available car cover, any model of car can be reproduced to blend in with a national style or fashion. The Porsche tent was stolen, but others continue to be used. Michael Rakowitz frequently works with concepts of nomadism and urban appropriation. He teaches at Northwestern University in Chicago.